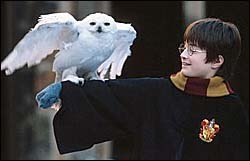 Daniel Radcliffe discovers that owl talons are sharp and quite pointy. I wouldn't consider myself a muggle, but I did walk into this adaptation of the J.K. Rowling blockbuster novel without ever reading it first. Instead of scrambling to catch up with what the rest of the planet has been enjoying for years now, I wanted that clean burst of cinema, to see the film with unfettered eyes and expectations. Since, if the filmmakers have really done their job correctly, I shouldn't have to know who Ron Weasley is or how you play a game of Quidditch before I walked into that theater. It's a pleasure to report that even for the uninitiated like myself, "Harry Potter And The Sorcerer's Stone" (IMDb listing) is a delectable film that will be sure to send the minds of fans everywhere to places they've been dreaming about, and non-fans to places they would like to see more of soon. Not that I need to go into the story, but for those like me, it goes something like this: Harry Potter (Daniel Radcliffe) is an orphan living with his evil Aunt Petunia (Fiona Shaw) and Uncle Vernon (Richard Griffiths). Upon his 11th birthday, Harry is invited to the Hogwarts School Of Witchcraft And Wizardry to nurse the great sorcerer powers he never knew he had. With the help of the school's groundskeeper Hagrid (Robbie Coltrane, nearly stealing the film), and friends Ron Weasley (Rupert Grint) and Hermione Granger (Emma Watson), Harry learns to fit in to his new surroundings, even though he smells trouble around one of his instructors, the slimy Professor Snape (Alan Rickman). As Harry learns to control his powers, he also discovers the true nature of his parent's demise, and why a lightning bolt scar above his right eye holds the answers to his true destiny. The success of "Harry Potter" doesn't surprise me in the least bit, as the film was directed by Chris Columbus, probably the foremost child-actor director around. The critically despised director of "Stepmom," "Home Alone," "Mrs. Doubtfire" and the slightly overwrought "Bicentennial Man," I've never had the problems others seem to have with his sugary directing style. He's a mainstream filmmaker who makes film for the mainstream. What's the problem? Yet, this time out Columbus has too many fans to answer to, and therefore he takes a much colder, methodical approach to this story. Not that the final film is unfeeling or antiseptic. On the contrary, "Harry Potter" is probably the most well-developed family film to come down the avenue in a long time. It's more that without having to water down the material so everyone can enjoy it (something that even I will admit Columbus has a habit of doing), Columbus has the unusual freedom to make a film this time out that isn't afraid to go to the dark edges of the narrative. Credit must also be paid to screenwriter Steve Kloves for adapting what obviously is a runaway firehose of a story. The first book in a proposed series of seven (The second book, "Harry Potter And The Chamber Of Secrets" is already filming and set for release 11/15/02), writer J.K. Rowling has had all the time in the world to set up the complicated universe of Harry Potter and also wallow in the fruits of her labor. As a screenwriter, Kloves isn't afforded that luxury. Working with a luxurious 150-minute running time, both Columbus and Kloves have the unenviable task of condensing the novel into a feature film that won't disappoint fans or bore the rest of us. The film does have that typical novel-to-film hurried feel to it, as the filmmakers are trying frantically to make sure everything well known from the book gets into the film. And while that creates a much more epic tone to "Harry Potter" than I expected, it also detracts from the overall experience toward the end of the film as the story becomes a little too thick for the big screen to handle. Not that boredom sets in, but more that claustrophobia begins to overcome whatever joy I had watching the film up until the last 15 minutes. Regardless of the picture's inevitable shortcomings, Columbus does fantastic work realizing Rowling's world. Using just heaps and heaps of special effects, Columbus is fearless in attempting to bring the Harry Potter legacy to theaters. From the brooding magical darkness of the Hogwarts School (brought to life with stunning production design work from Stuart Craig), the roaring anger of a confused 15-foot Troll, the three headed dog that guards the stone of the title, to the floating candles (and seasonal to boot) that illuminate the dining room of the school, the production has seemingly spared no expense in the quest to please. Of special note is the mid-movie Quidditch game that will surely be on the lips and in the daydreams of the children who leave the theater. Almost criminal in its burglary of precious running time, the Quidditch sequence nonetheless ends up being the film's highlight. It's a rare chance to take a run though Harry's world without care of advancing the story. A mixture of the speeder bike sequence from "Return Of The Jedi," the English game Cricket, and spectator reactions not unlike a Scottish soccer crowd, the Quidditch game is such a rousing success I wished the local sporting goods store sold flying broomsticks. Cheers to Columbus for not dropping the ball on what will be the most anticipated and talked about sequence in the entire film. In the title role of Harry Potter, Daniel Radcliffe makes a sharp impression for his first starring role. A talented young man who seems to understand exactly what kind of film he's in, Radcliffe is the perfect choice to portray the talented Mr. Potter. The production wisely avoids using mop-haired American adolescents to fill the cast, instead using Brits for the whole roster of characters. The end result leaving "Harry Potter" with much more class and dignity than if it had been "Americanized." And while the entire cast is game for the story, Alan Rickman brings the most sense of humor to his role of Professor Snape. With his oily, glam rock haircut and sneaky, watching eyes, the subdued Rickman acts as a perfect counterpoint to all the technology on display in "Harry Potter." Though it's not perfect by any means, "Harry Potter And The Sorcerer's Stone" should still please all those who are looking forward to it. And even for us muggles, "Harry Potter" is a shot of pure moviegoing magic that, if continued to be made with care, could logistically last for another six movies. I can't wait for the next adventure.